Computer Education Institute, ISS Computer Education is a full computer training organization specializing in hands-on learning. Growing for more than 3 years, ISS Computer Education is the largest training center in NCR. Our Mission statement is to provide a quality Training that exceeds the expectations of our students, no exceptions. We teach a range of classes that start with the very basic computer user and extend to the very advanced MCSE student. 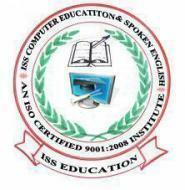 Iss Computer Education conducts classes in C++ Language, Computer Course and Computer Networking. It is located in Sector 38, Noida. It takes Regular Classes- at the Institute.